Imitation Lambswool is extremely comfortable for a dog to lie on and the Extra Large Dog Bed from King Pet Bed has this quality interior. It’s so large that even a Great Dane can comfortably use this bed. Actual buyers who reviewed the bed approved of it for their large dogs, one mentioned was a 70 pound Labrador. The hem is elastic, so that makes it easier to remove the cover for it to be washed. While you can machine wash this one, you do have to line dry it. 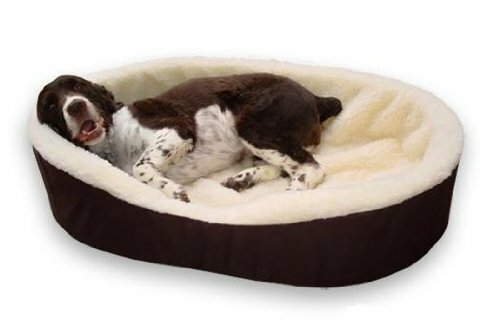 Your pet will be comfortable in this quality cuddler style nest bed that’s made in the USA. The thick foam base combined with the quality interior fabric provides maximum comfort for your pet. Dog Bed King prides itself on manufacturing the most durable pet beds in the industry.